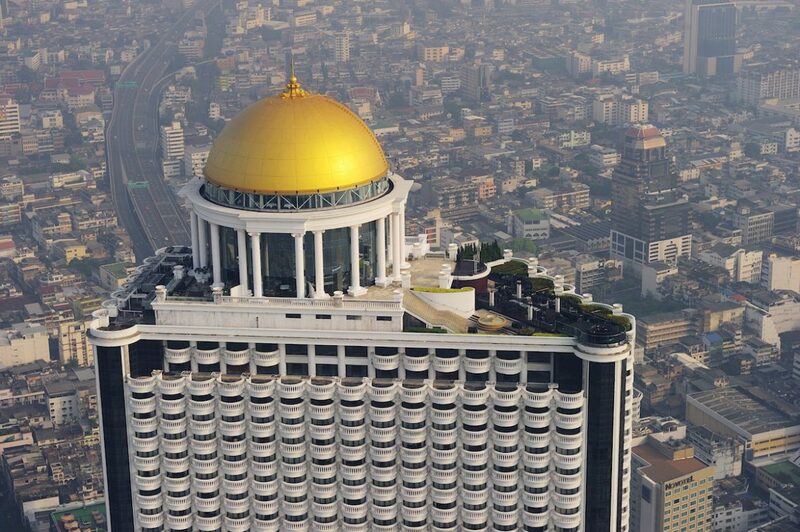 With a favorable exchange rate, rooms at the magnificent five-star Lebua Hotel in Bangkok are reasonably priced. The rooftop bar alone is worth the 20-hour plane ride. 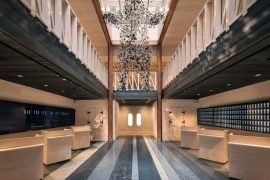 Some travelers seek a spiritual experience by going on religious tours like following in the footsteps of St. Paul to Greece. Others follow a literary path and delight in hiking the stormy moors where Heathcliff and Catherine rambled as children in Wuthering Heights. For our trip to Thailand, we ended up on The Hangover II tour. We didn’t plan to follow in the ill-fated steps of Phil, Stu, Alan and Doug, yet on our recent trip to this Southeast Asian country where tourism is once again on the rise, we found ourselves at two of the major locales featured in the 2011 film. 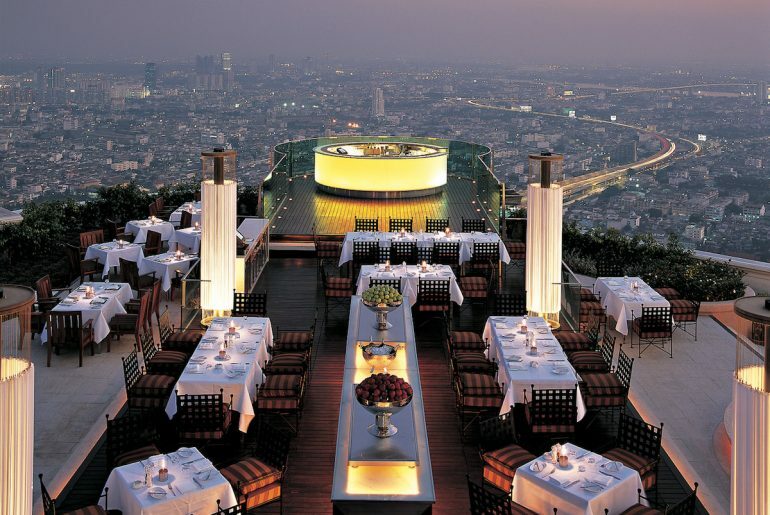 Bartenders and guests at Sky Bar at Lebua Hotel in Bangkok have 360-degree views of the city. Our first stop was the capital city of Bangkok, the most visited city in the world. Luckily, we were not in a filthy room at a no-star motel with a chain-smoking, drug-dealing monkey, a shaved head or tattooed face. No, we were guests in the monkey-free Tower Club at Lebua Hotel, where a few scenes with the villain played by Paul Giamatti were filmed. 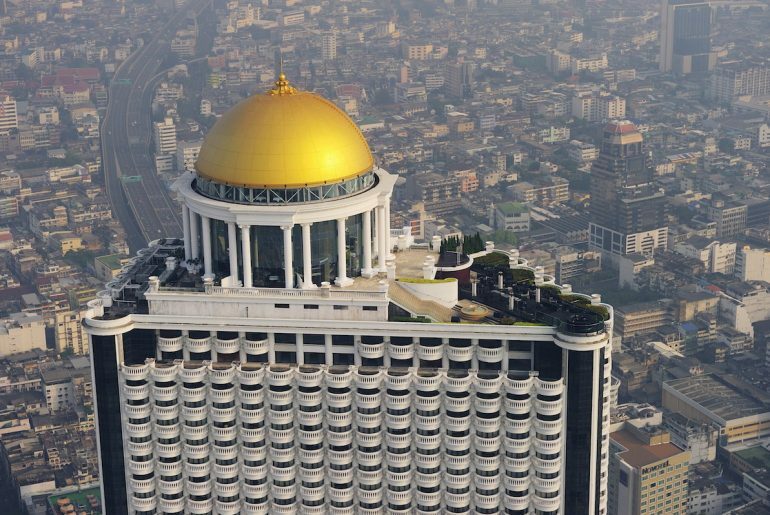 Because of the favorable exchange rate, five star hotels in this exotic city of 8.5 million are affordable for Americans, so we took advantage of the luxurious accommodations at Lebua. Although we’d been traveling for close to 20 hours, and arrived at the hotel at midnight in that jet-lagged state characterized by glazed eyes and barely sustained ability to form a sentence, our moods and energy picked up immediately as we settled in to enjoy our pre-arranged Thai dinner served on our balcony. We fell into bed, but awoke the next morning, not with a hangover, but with an appreciation of our spacious two-room suite, with two bedrooms, three balconies, a large sitting area and kitchen. For the next five days, we had a balancing act to perform — exploring the many enchanting, chaotic, crowded and intense sights of Bangkok, then returning to the calm respite and wonderful dining and culinary opportunities at Lebua. Our introduction to the city came in the form of a breakfast boat ride on the Chao Phraya River, where our well-informed guide pointed out sights like the pagoda of the Temple of Dawn and the ramshackle houses barely clinging to the edges of the banks along the narrow channels. The Hangover Suite. 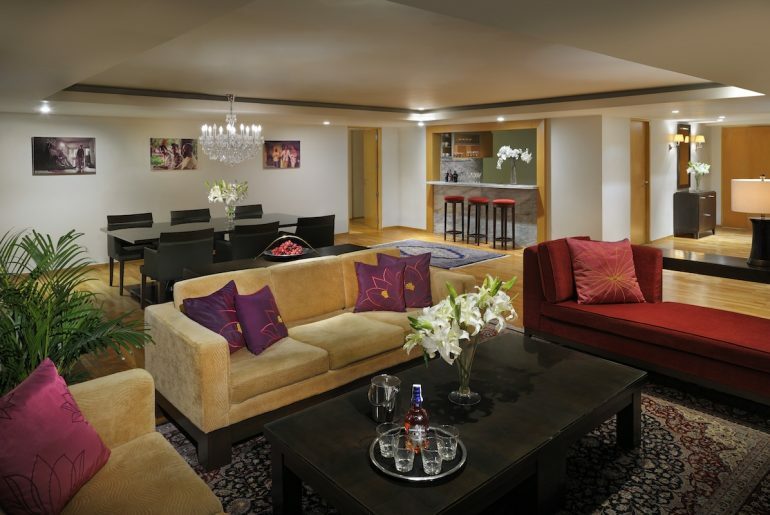 This three-bedroom suite hosted the cast when they were filming at Lebua. A major must-see on the weekend is the Chatachak Weekend Market, (also known as JJ’s), 35 acres with more than 10,000 stalls, one of the largest in the world. With no agenda and no compulsion to buy anything, a somewhat foreign feeling for me, I enjoyed wandering through the themed sections. A bit more manageable in size and number of tourists, a trip to a spice market was its equal in exotic fare, with pink eggs, unidentifiable bags of spices, and rows of freshly caught seafood of every variety. As somewhat of a rooftop bar aficionado and lover of al fresco dining, I found my ultimate location that night with the Sky Bar and Sirocco restaurant, the highest al fresco restaurant in the world, located on the 63rd floor. The circular bar seems to hang on the edge of the roof, as several bartenders perform well-rehearsed choreography to create concoctions for the guests. We had to try the signature Hangovertini, made with green apple juice, green tea liquor, rosemary-infused honey and Martini Rosso. As the sun slowly set over the city, the bar began to glow, the patio lights came on and the towering gold dome lit up as well, casting an enchanting light as we made our way to internationally recognized Sirocco next door for dinner. The Chef’s Tasting Menu, always my favorite way to dine, included Atlantic Scallop, Goose Rillette Capelletti and Atlantic Hake Fish. It helped that we didn’t have to focus on the menu, as the waiter was making flaming cocktails that briefly lit up the dark sky. While we moved indoors the next night for dinner at Mezzaluna, we still had views of the sky through the expanse of windows on the 65th floor. As we dined on an elegant seasonally inspired menu and listened to the melodic sounds of the quartet, I positively wallowed in the quiet and sophisticated elegance, a sharp contrast to our eventful day of sightseeing. After a short plane ride approximately 500 miles south, we landed in Krabi, where the relaxed and scenic 50-mile drive through small villages and the Thai jungle was in sharp contrast to the crowded, noisy streets of Bangkok. Our destination was Phulay Bay, the first Ritz-Carlton Reserve property opened in 2010 with just 54 villas on 50 meticulously landscaped acres, and a guest ratio of 3 to 1. I am not, nor will I ever be a movie star of VIP. Unless you count my VIP Foot Massage card, which I don’t. But I felt like one at Phulay Bar in Krabi, Thailand. While I am not, nor ever will be a movie star or member of a royal family, from the moment we entered the mystical confines of Phulay Bay, I felt like I was playing the role I most aspire to. 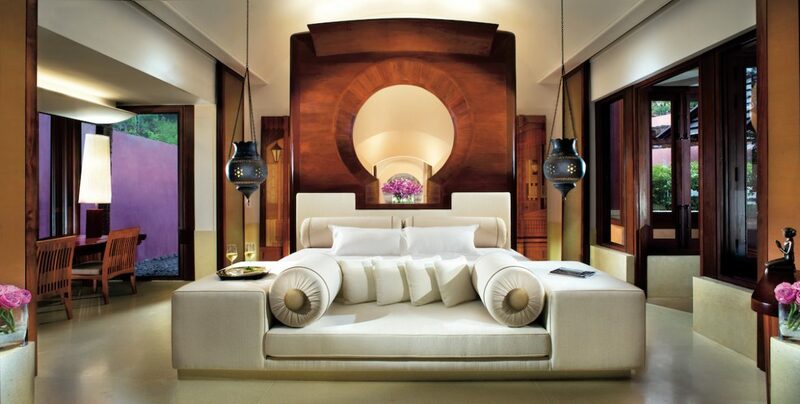 Pampered, spoiled guest in paradise. 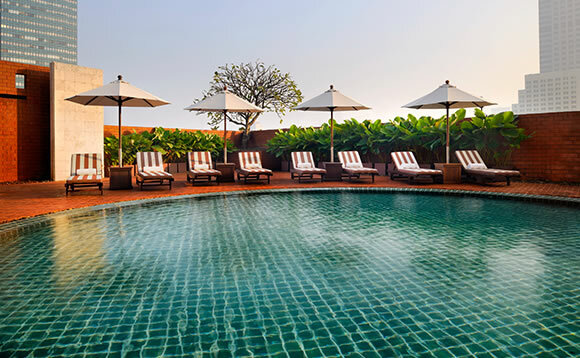 Guests enter an enclosed courtyard with 20-foot-high purple walls, whose floor is a shallow pool, by stepping along a path of submerged stones to a large open Thai pavilion where we were greeted, checked in, then driven to our villa by golf cart. I had to stop myself from giddily skipping along the stones as I was so delighted to be there. And the giddy feeling only increased when I saw our Royal Villa, simply the most spectacular hotel suite I’d ever seen. We had a giant bed with a view of the Andaman Sea, our own private infinity pool and verandah with daybed, private gardens, indoor and outdoor showers, and a walk-in closet for each of us. Various connecting chambers could be walled off with sliding doors. On a romance scale of 1 to 10, this room was about an 87. This was our bedroom. Can you believe it? And that’s just a portion of the space that included several other rooms, pool, outdoor gardens and an outdoor shower where I’m fairly certain Bradley Cooper showered naked. My husband did as well, and I’ll pretend that’s just as noteworthy. And there was the added bonus that Bradley Cooper was naked in my shower. While I can’t claim that I was there at the time, he had been there four years earlier during the filming of Hangover II, when the cast spent 45 days at Phulay Bay while filming multiple scenes. And while I couldn’t confirm that he actually stayed in our room, it’s hard to imagine a better space for a movie star to bed down after a tough day of filming scenes, like the one when Stu finally gets married. The guests release glowing sky lanterns into the darkening sky against the backdrop of limestone cliffs rising out of the Andaman Sea. We spent three enchanting days here, lounging by the large pool and enjoying drinks at sunset with our feet in the sand at Chomtawan Bar. One day we took a longtail boat to Hong Island, where our captain motored us inside a shallow lagoon, we lounged on the beach, snorkeled and hiked on the island, observing wreckage of wooden boats that had washed up on the island, and left there in memory of the tsunami in 2004. 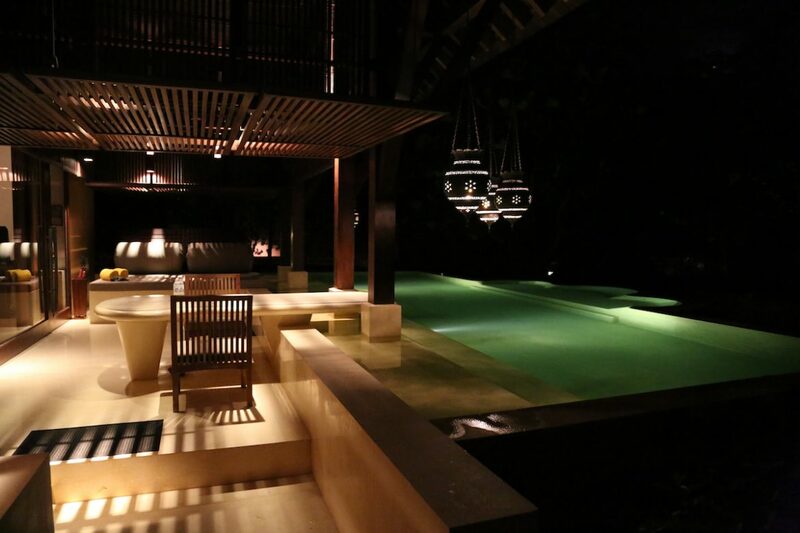 Our private pool and terrace lit up at night. I barely wanted to sleep during out stay there, as the accommodations were so beautiful. Other off-resort activities for guests include fishing, diving, snorkeling and kayaking among the limestone cliff formations. Land activities include hiking through mangroves, caves and the jungle, visiting temples, helicopter tours and even elephant trekking. 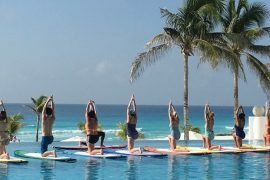 On the reserve, guests can take learn how to make banana leaf animals, make decorative garlands, take a variety of yoga classes, participate in a singing bowl mediation, take a meditation class led by local monks or take a Thai massage class. We opted for a Thai couples massage at the spa where we laid down on grass mats in the supplied cotton pajamas and were twisted and stretched all kinds of ways I’d never been stretched before. 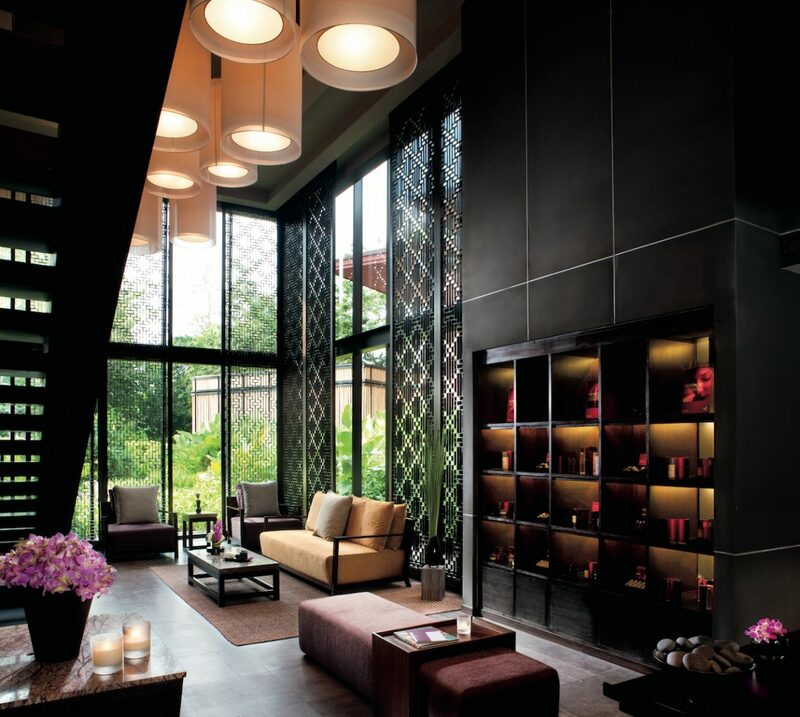 The reception area for the spa, where we enjoyed a traditional Thai couples massage. I was stretched and manipulated in new ways I previously impossible. One evening we enjoyed a private seafood dinner in the Lae Lay Pavilion, surrounded by water and romantically illuminated by traditional hanging lamps. Once again, I felt like we’d fallen through some magical hole in the universe and wok emerged as movie stars ourselves. As for the town of Krabi, it may be a wonderful place, but with a suite like ours and and resort like Phulay Bay, we had no desire to spend a minute of our precious time there away from it. 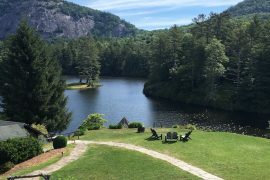 If I ever had movie star money, I’d be sure to book this place for an extended stay for its quiet elegance, beauty of the grounds and privacy. While the movie Hangover II might not have been a favorite of the critics, in fact it was nominated for a Golden Raspberry Award for Worst Sequel, these two properties where it was filmed earn an enthusiastic two thumbs up and a standing ovation from us.